A type of paper that has had the acid removed from the pulp so that it has a neutral pH (7.0 or above). A portion of a document that extends beyond the intended borders, having the image “bleed” over the edge. The process of binding multiple sheets or spreads together to form a multi-page document. Most booklets require a page count that is divisible by 4. How a customer (or potential customer) experiences your company through a variety of touchpoints. A type of coated paper that transfers information written on the top sheet to sheets underneath. An abbreviation for ink colors: Cyan (C) , Magenta (M), Yellow (Y), and Key (K) also known as Black. These colors are combined to create all other colors in printing. Using a steel blade to cut paper or vinyl in a specific shape. Dot is the basic halftone printing unit. A series of these dots are combined to create a printed image. Dot gain is the effect of the halftone dots growing between the original film and the printed sheet. It’s a measurable, predictable, controllable effect of the printing process. Raising letters or graphics on a project (sign, folder, or letter) through stamping, hammering, or molding. Cutting a design into the surface of a hard material using a handheld machine. A file format that be inserted into other files. It stands for Encapsulated PostScript Format. The structure of how information is encoded in a computer file. (I.e. JPG, EPS, etc). The final stages of creating paper that enhance the finished product. Digital files assembled and ready for platemaking, the final step before printing. Pressing a heated die onto a sheet of foil that transfers it to the paper, creating a foil design on the finished product. The dimensions of a finished project after it’s folded. A type of fold that entails the left and right sides of a page being folded into the middle without overlapping. Using plastic binding combs to hold together a manual or booklet. The direction of fibers in paper generated during production. An image with at least 300 dpi (dots per inch). Part of the prepress process that consists of arranging the project on a print sheet in order to obtain faster printing, simpler binding, or reducing waste. The last test that is printed before beginning the print run. A way to evaluate the color mixing of a printing ink by depositing a layer of the mixed ink on the surface using a smooth-edged knife. A common file format for compressing color digital images. A type of paper with a ribbed texture. A common type of fold with both ends of the paper folded toward each other so that they overlap. A type of paper that emulates the look of linen cloth with slightly lifted grooves that give it a textured feel. A link is a connection between a web source to another. An item that requires ordering from a manufacturer. A printing process that transfers ink from a plate to a rubber plate that deposits the ink onto the paper (instead of directly from the plate to the paper). The dimensions of an image when it was originally created. The series of numbers assigned to a book or document. The visible surface of a sign on which copy and/or art is present. One or more panels make up the sign face. A standardized color matching system used in the printing industry to ensure the consistency of color from design to final print. PDF stands for Portable Document Format, which is a file format used to present documents independent of software. A PDF of your project for you to approve before going to press. A bindery method where all pages are trimmed to a single sheet, clamped together, and wrapped with a spine all glued together. Creating a line of small dots with a binder machine with the purpose of tearing-off a part of a page. The ability to see individual pixels in a picture because it is blown up too large. A binding style that uses a plastic coil to create documents, reports, or presentations. A standardization color scheme used in the printing industry to ensure the consistency of color from design to final print. PNG stands for Portable Network Graphics, which is a file format with low resolution images that don’t sacrifice quality. Work done on a publication before it is actually printed (typesetting, layout, etc). Converting digital images into a series of pixels that can be displayed on a screen or printed. Reusing content in a form different than that which it was created (i.e. pulling a blog post from an ebook). RGB (Red, Green, Blue) refers to a system of displaying colors on a computer screen. These three tones can be used to create any other color. Binding with staples in the spine of the book. A method of printing that is capable of producing great detail and color on a variety of materials (ie. paper, plastic, vinyl, etc). Sheets and pages are often used interchangeably, but they are not the same. Sheet refers to a sheet of paper. Sheets are folded to create pages of a booklet. (ie. Folding one sheet of paper in half creates 4 pages). A group of pages that are printed on both sides that are folded, trimmed, bound and cut. The number of pages on a signature depends on the page size and the size of the press sheet they fit on. A smooth, delicately-embossed paper with sheen. Also referred to as satin. A type of paper that is ideal for printing lots of details. Any color that is printed using a single run. Offset printing is composed of four colors: Cyan, Magenta, Yellow, and Black (referred to CMYK). A printing process that relies on heat to create slightly raised text or images on the surface. Tagged Image File Format (TIFF) is a standard graphics file used for exchanging raster graphics images between programs. Creating a third color when two colors overlap in screen printing. 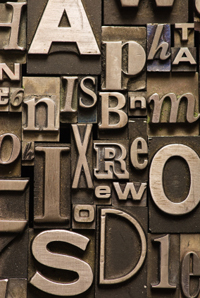 A print industry term that evolved from process of assembling metal letters or words to begin the printing process. The term is still utilized some today to define the processes of manipulating or changing digital artwork before production. Paper that has flat or non-gloss finish. Can also refer to paper that has not been coated with UV or Aqueous coating during the finishing process. Liquid applied to a printed sheet that is bonded and cured with UV light during the finishing process resulting in a durable surface. A form of digital printing where elements such as text or images can be changed from one printed piece to another. A type of liquid coating applied to paper that are available in gloss, satin, or dull finishes. Vector art uses mathematical equations to create art that is clean, camera ready and can be scaled infinitely without any loss of quality. Vectors are created using software programs like Adobe Illustrator. Smooth writing paper that imitates vellum. Board or heavy card stock include 10pt., 12pt., 14pt. and 16pt. A folding method that creates six panels with equal sizes, three on each side of the paper. Two folds are made in opposite directions that form a shape that resembles the letter Z.